The Samsung CE107F-S is pretty big - measuring 51.7cm by 31.0cm by 48.5cm, and weighing 18.5kg. However it is also incredibly spacious, with a 28 litre capacity, measuring 35.8cm by 23.1cm by 32.7cm inside. As such, it will be ideal for larger families and households, and will accommodate the vast majority of larger plates and dishes. 6 different power levels are include up to a maximum of 900w when in microwave mode. The timer handily goes up to a maximum of 99 minutes, making this model suitable for those who like to slow cook dishes. The controls are mainly labelled with symbols rather than text, and at first you may not to consult the manual - however once we'd worked out which button operated which function, it was plain sailing. The combination oven setting works very well, and will be ideal for those who like to roast and bake. Overall construction is pretty good - it feels solid and like it is built to last. The black design is pretty understated, but our test team liked it, and it will suit the majority of modern kitchens. 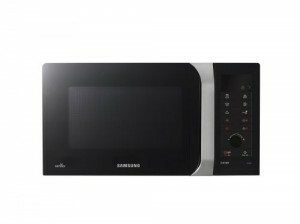 A very spacious family microwave - the Samsung CE107F-S is well built, easy to use and will provide a reliable method of cooking. Recommended.